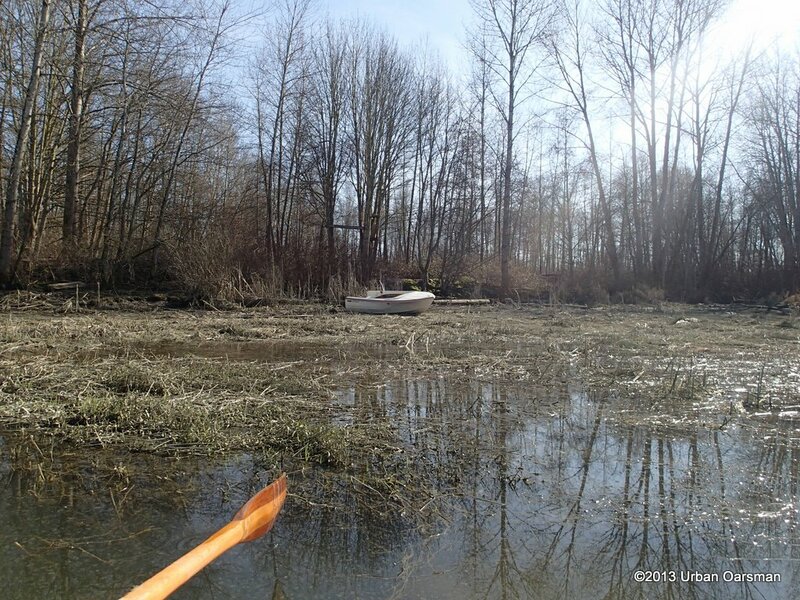 Deas Island Slough, and Green Slough. 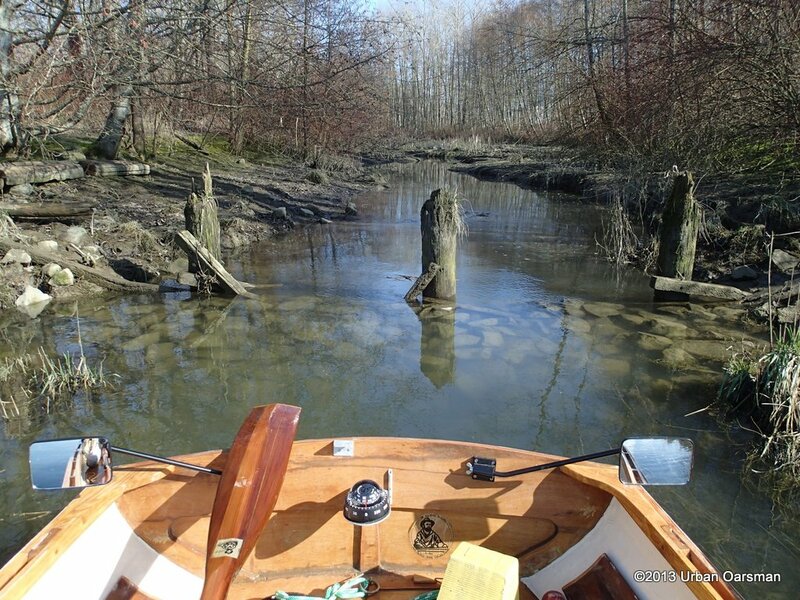 Deas Island Slough. /Green Slough. Click on picture for larger format image. The jumper incident. 10:13am, I see a man go over the edge off Second Narrows Bridge. The RCMP Officer was only seconds behind him. Almost caught him. But missed grabbing his jacket…. Two North Vancouver RCMP cruisers. Emergency lights flashing, go on to the Second Narrows Bridge ahead of me, one from Dollarton Highway on ramp, one from Marine Drive. They are both in the right hand lane, driving slowly. They stop about ¼ o f the way over the bridge. Both Officers get out, one male, one female. The male officer is in the lead. They run past two bicyclists going north, and race towards a guy standing on the bridge. He turns and runs, going over the side of the bridge just as the officers get to him. I pass the officers and the jumper just as he goes over the edge. “Oh my god” I think, “we are not even over the water yet”. The RCMP Officer has just missed grabbing the guy by a second or so. As I pass the Officers, they are hanging over the edge, looking down. “Not much of a way to begin a row” I think. 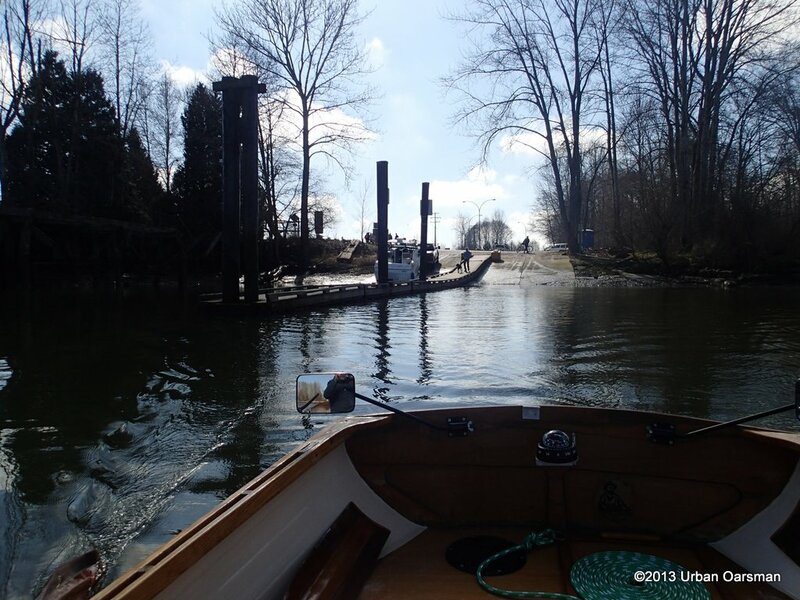 I continue driving on, to the boat launch in Ladner, with Gwragedd Annwn in tow. I arrive at the Boat launch by Captain’s Cove Marina at 10:50am. I put Gwragedd Annwn in the water and I am ready to go by 11:10am. 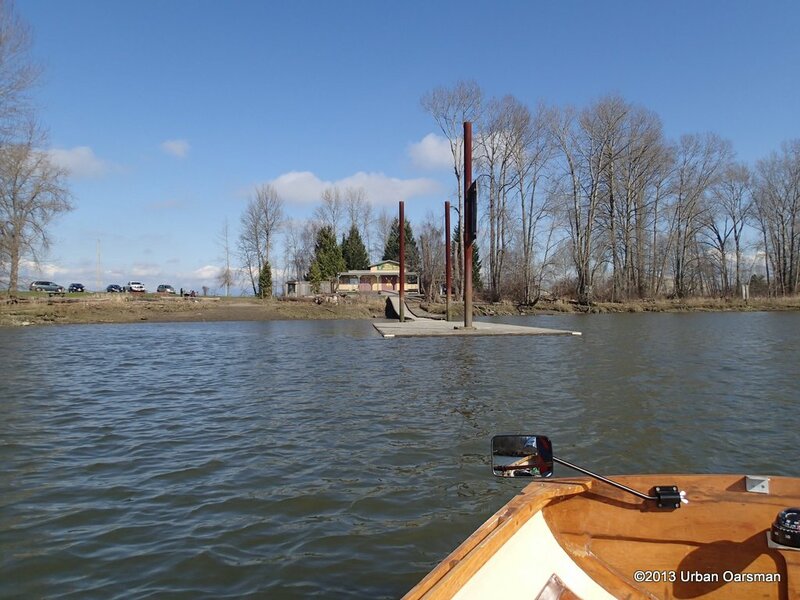 The boat launch and parking is free. Two runways, one dock. 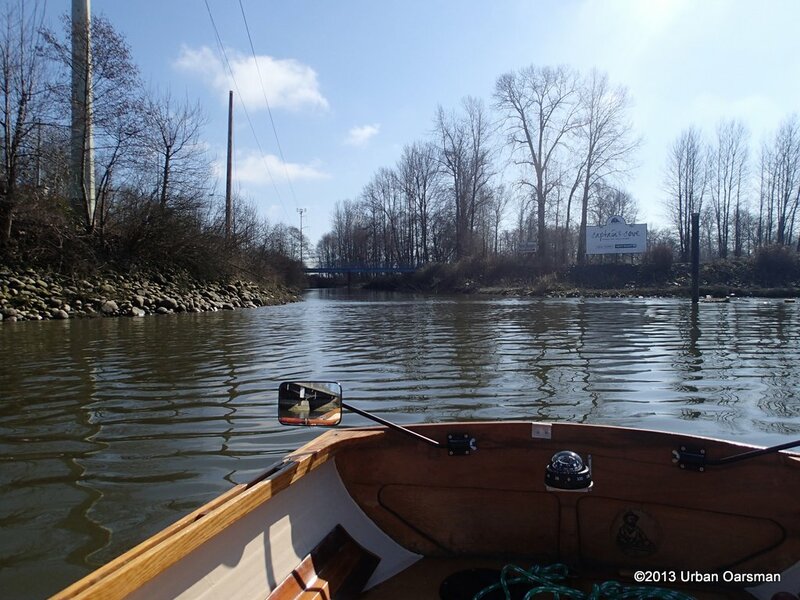 Rowing away from the Captain’s Cove Boat launch. Gwragedd Annwn leaving the dock. 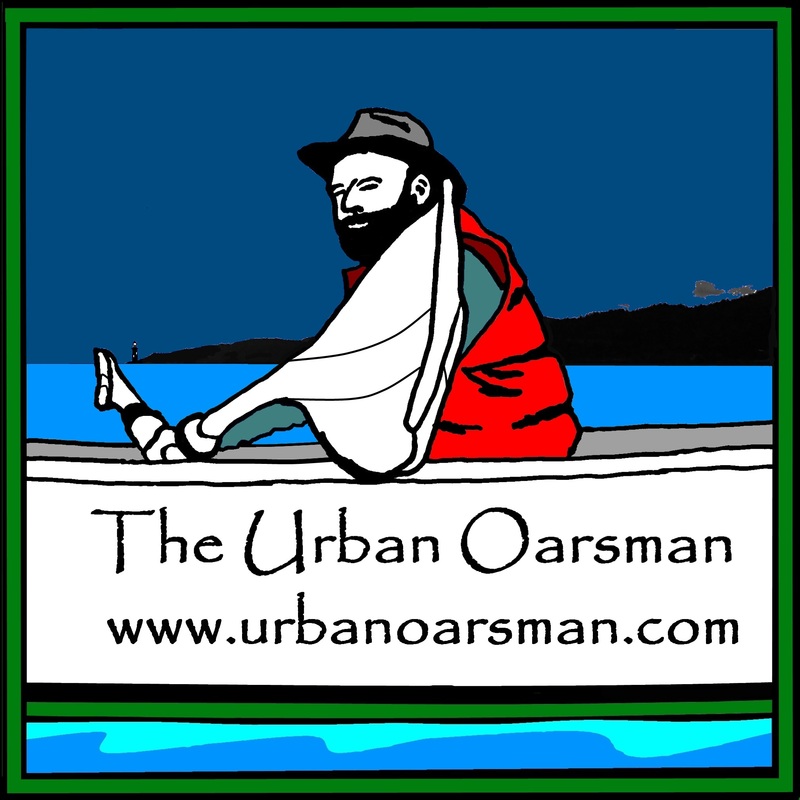 Another rowboat launches when I do….A car-top flat iron skiff built by the owner. There is a Mom, Dad and a small child. 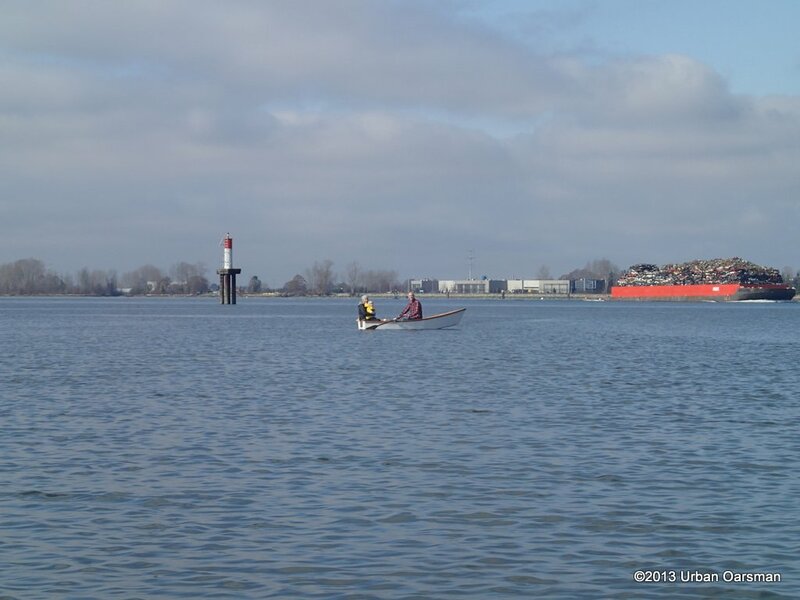 I row up the south side past Captains’ Cove Marina. 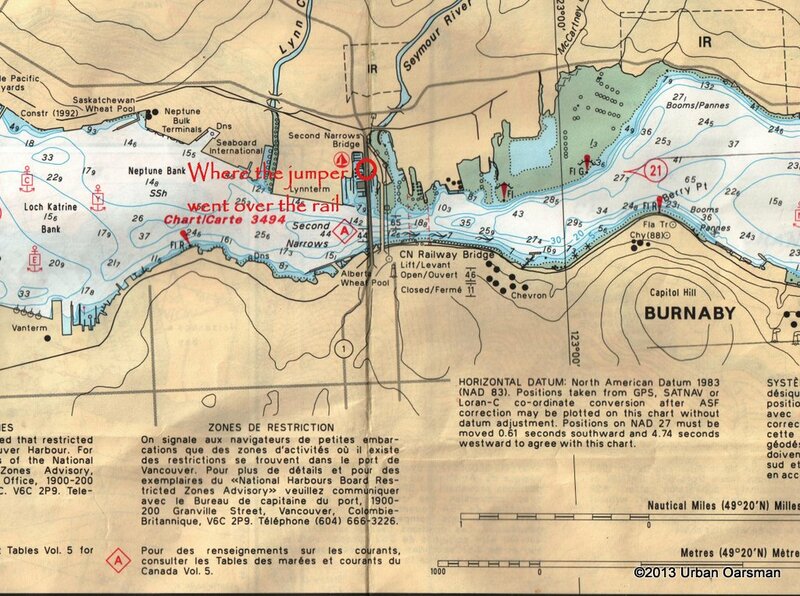 The entrance to Green Slough is to the South, just past the marina and before the Highway. 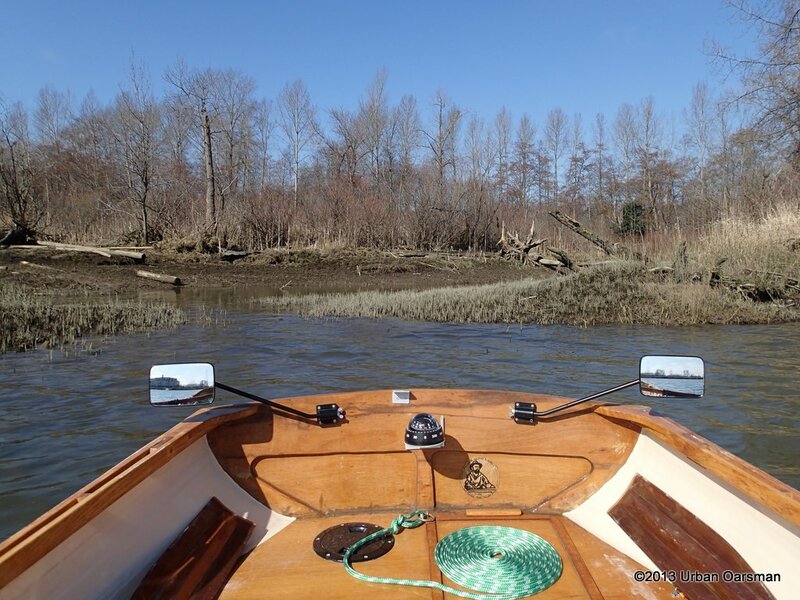 The tide is low, I will row up it on my way back from Deas Island Sough when the tide is higher. I pass by the drainage canal before the River House Restaurant and the River House Pub on the west side of the highway. I do not know what the canal is called, but, it does not matter, the way is blocked by fallen trees and some sort of drainage gate/pump house. Trees Blocking the drainage canal with the pumphouse behind. There is a sunken wooden ship, sources say that t is the rum-runner the “Audry B”. Then another drainage canal blocked by a pump house. 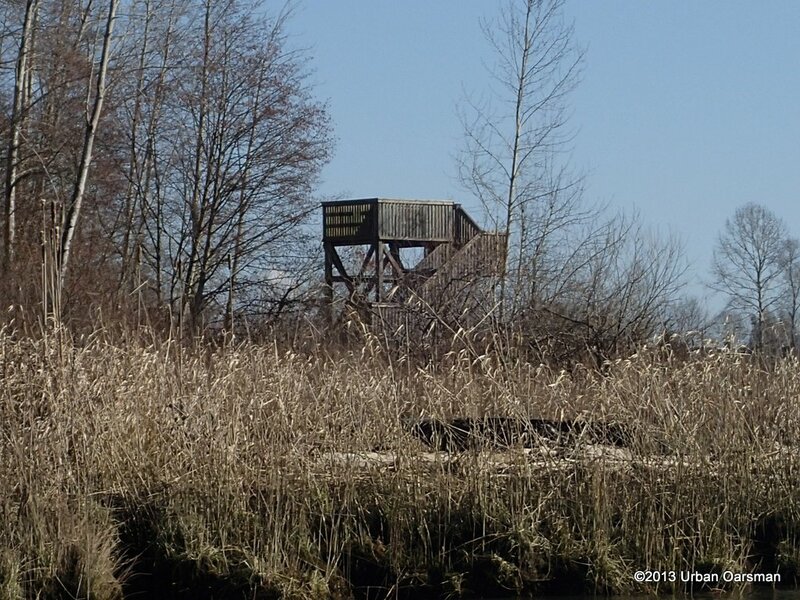 I can hear walkers talking from a pathway on the North side of the Slough. I smell a strong cow smell from the barn on the south of River Road. 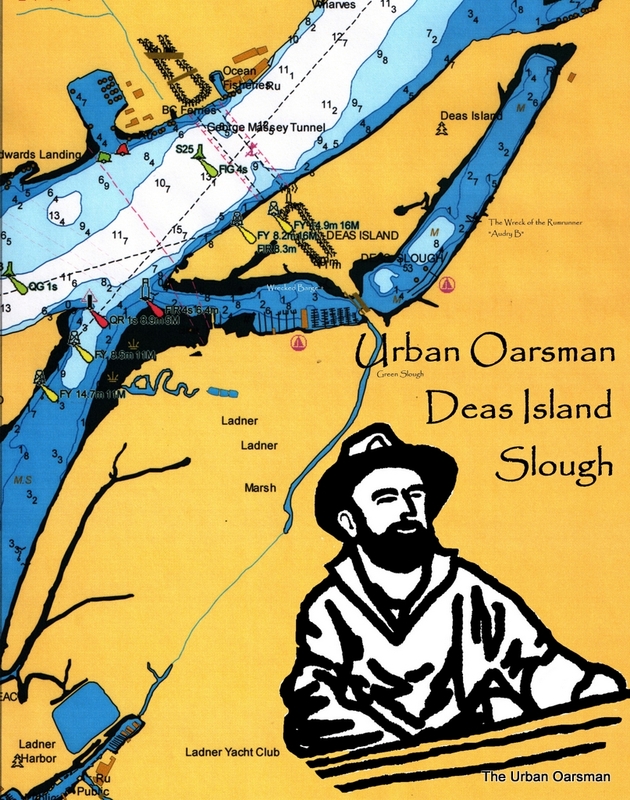 At the Far East end of the slough is the Delta Deas Rowing club. No trailer launching that I can see from the water, a low floating dock. A dolly ramp to the south of the club. 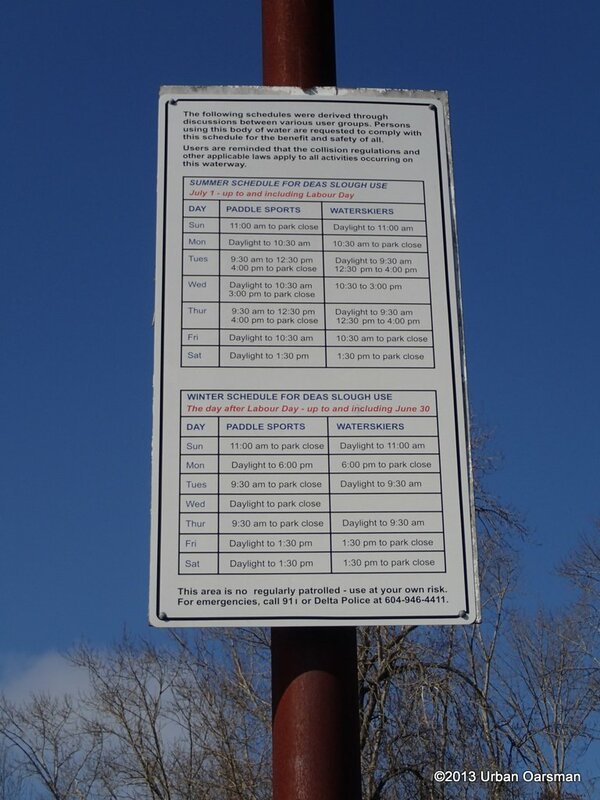 There is a Slough usage sign posted on the dock North side of the slough. 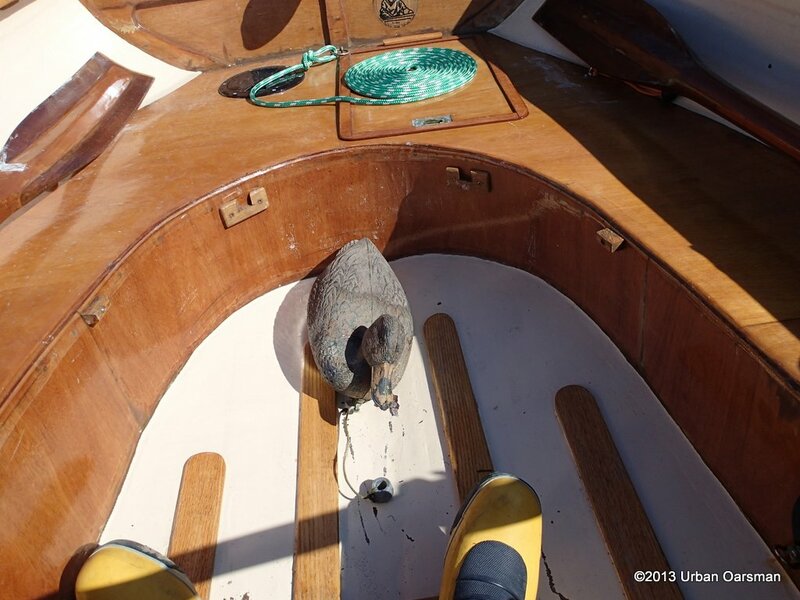 Rowing on the North Side, I notice three offshoots to explore, I nose in, but, I will need a higher tide to do so. For now, I will just pass them by. 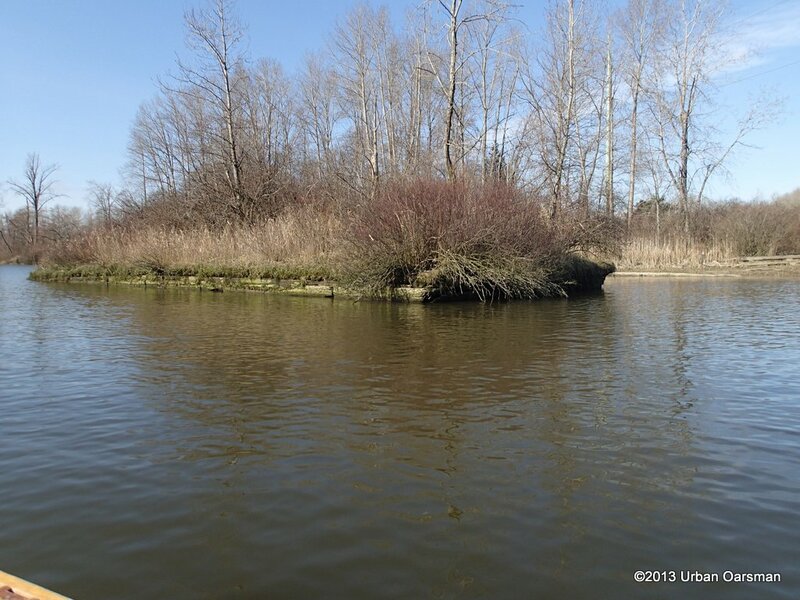 Side channel one, about 1/3 of the way down the North Side of the Slough. Side channel two, a little over half way down. I spot a duck in the reeds. It is not moving away, I close in for a photo…It is a decoy. Duck Decoy Swag!! The recovered Duck Decoy Swag. 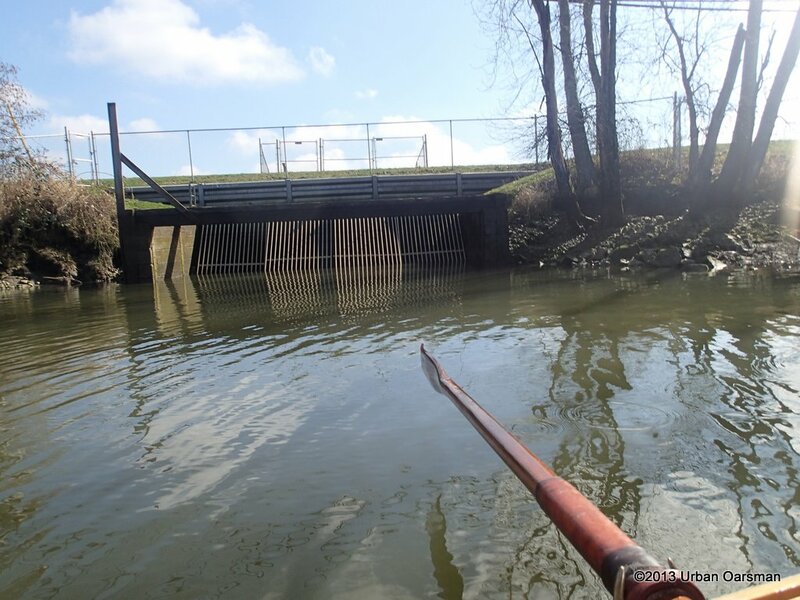 I row further on… Pike Pole Swag!! I am at the Highway overpass. 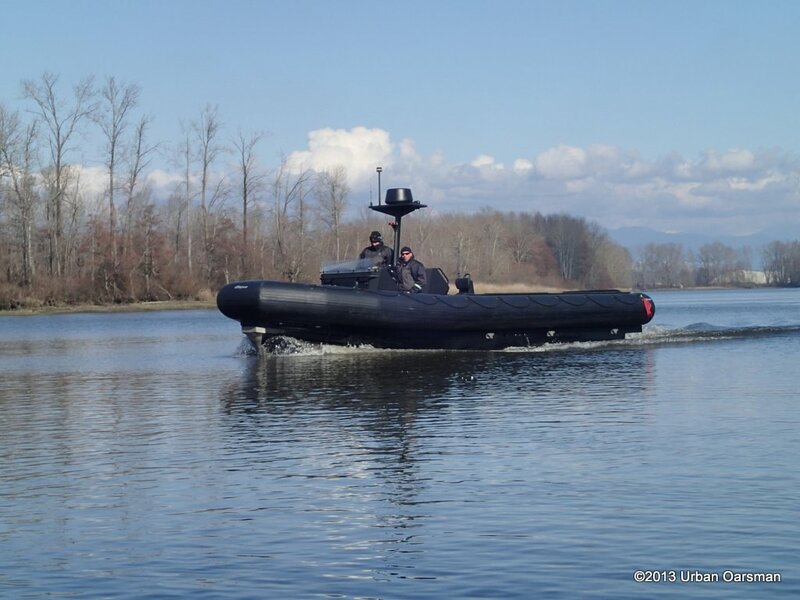 There is stealth (all Black) RHIB that goes up and then down the slough. Wonder what that is all about. 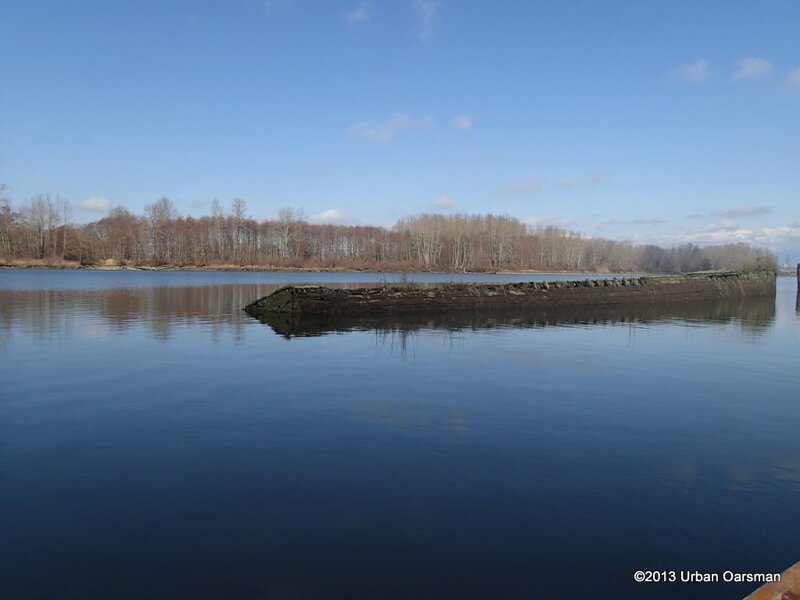 I row past a sunken barge, I cannot pass around it, and the water is still too shallow. There is a one-half current entering the slough by the Highway Bridge. 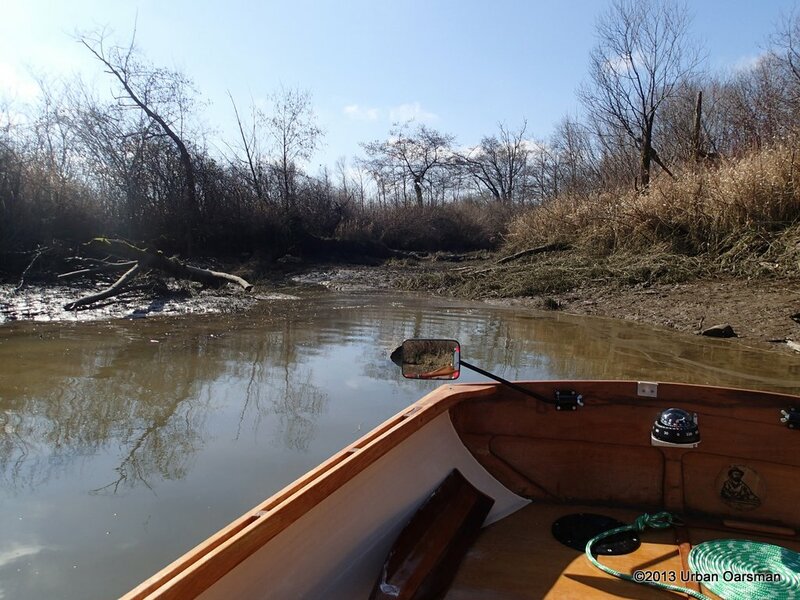 I row over to Green Slough. The entrance to Green Slough, just East of Captain’s Cove Marina and West of the Highway Bridge. There is lots of water now. There are many branches in the canal. 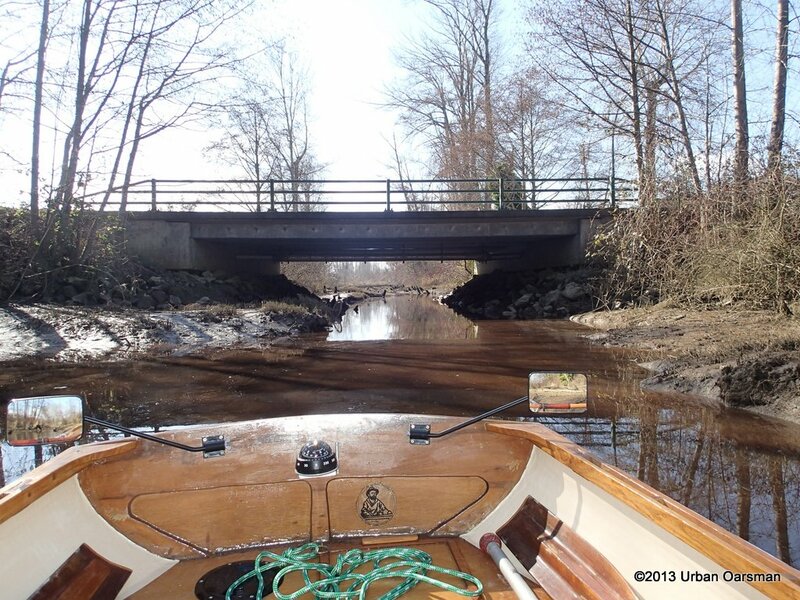 I row under the foot Bridge. The water is over two feet deep, and I can not see the bottom. Looking North West out of Green Slough past the pedestrian overpass to Deas Island Slough. 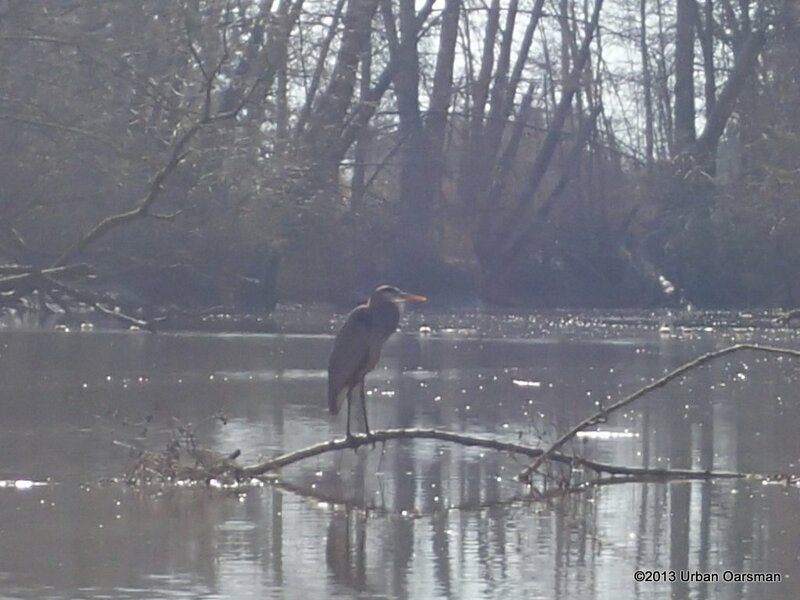 As I row down the slough, there is a Great Blue Heron on a branch in the water, I cause it to fly further down the canal. 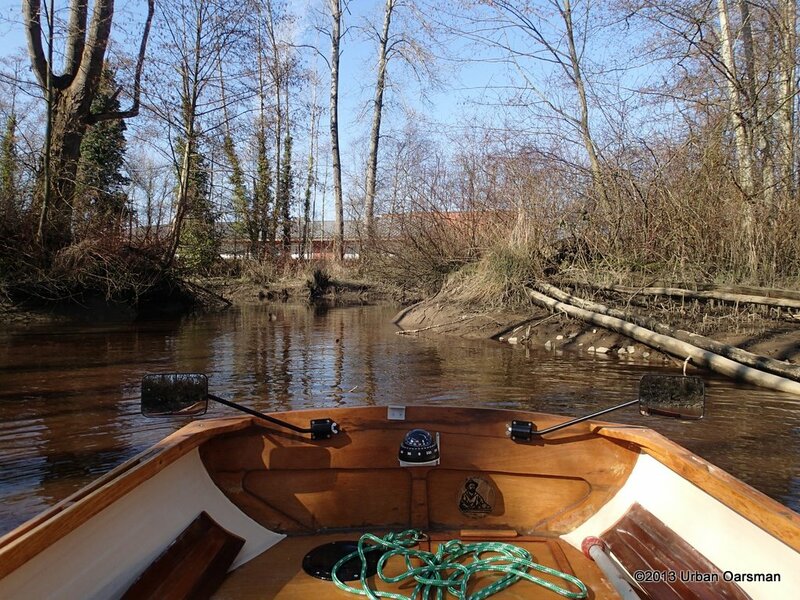 As I row down, we repeat this three times before the Heron finally flies up and out of the slough. I have been monitoring the radio and the Coast Guard announces that the notice to mariners about the closure of the Second Narrows bridge due to a jumper has been lifted. The Jumper has been taken into custody by the RCMP. The jumper that I had seen had just go into the structure under the bridge. The RCMP had followed him and talked him down. Good news. The further down the canal, the more tan and clear the water becomes. I pass houses on the south bank, with docks on the canal. I carry on, and come to a fork in the canal. I pick the larges and south route. This fork ends a little further on at the corner of Admiral Boulevard and River Road. The end of the channel at Admiral and River Road. Note =how orange-brown the water is. Peat coloured? I row back to the junction point and pick the other fork. It carries on under Admiral Boulevard to the West. 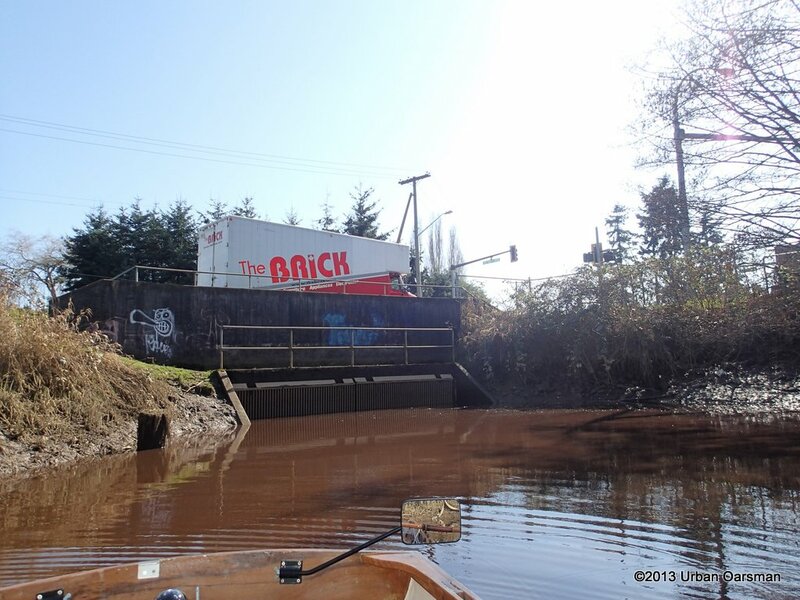 The canal is less than 20’ wide now, and in some places it is less than 10’ wide. The Admiral Boulevard Bridge over Green Slough. I have to pole Gwragedd Annwn through these spots. 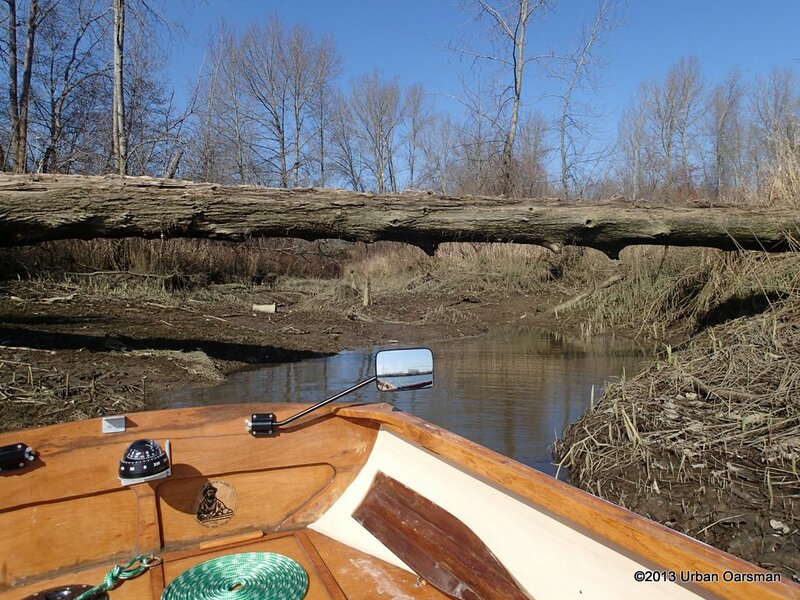 I come to where the channel is blocked by a fallen Cottonwood tree. 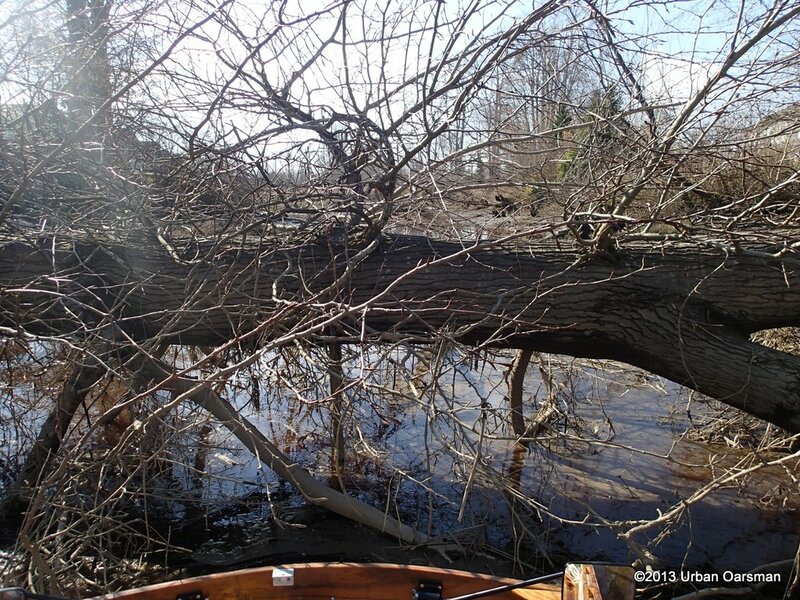 The tree has fallen from the South shore. The tree is maybe three feet thick. I can not go over the tree or under it. This is as far as I go. Did the tree fall during the big wind of December 2006 that smashed the trees in Stanley Park? The Cottonwood at the end of the line. As you can see, there are no green leaves. The tree has been here for a while. I row back past the backyards of the houses on Brigantine Road on the North and Regatta Way on the South. It probably looks a little muddy at low tide, but probably looks good at high tied. The water here has an orange tint. I have not seen any fish. A dead wheel barrow, a dead bike and crippled shopping cart. There are two side channels that do not go very far, just ending in small bays. 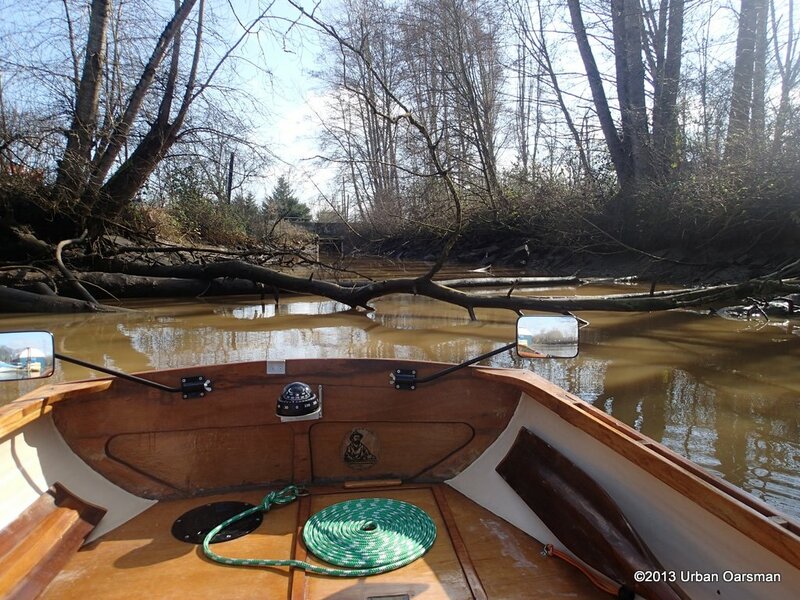 One of the short side channels off Green Slough. There is a golf course on the north of the channel. 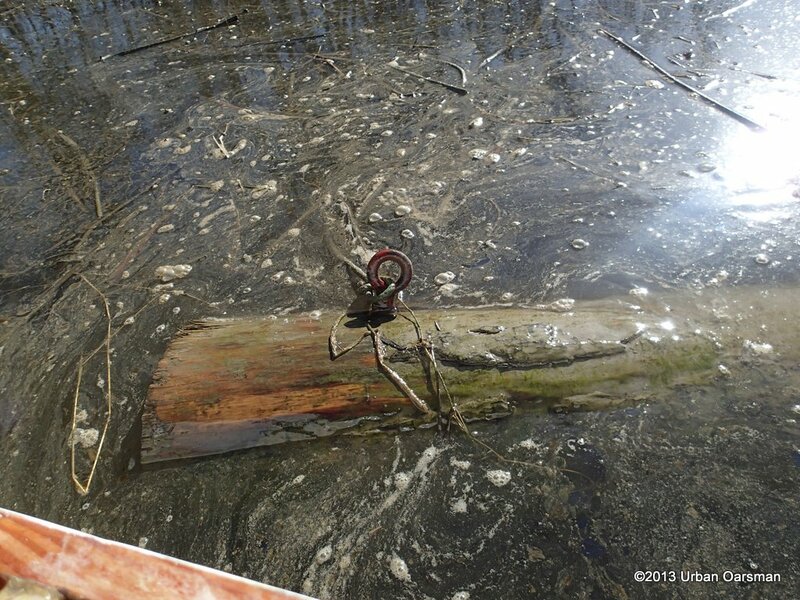 The tide has risen and logs that were in the way down channel are floated over on the way out. 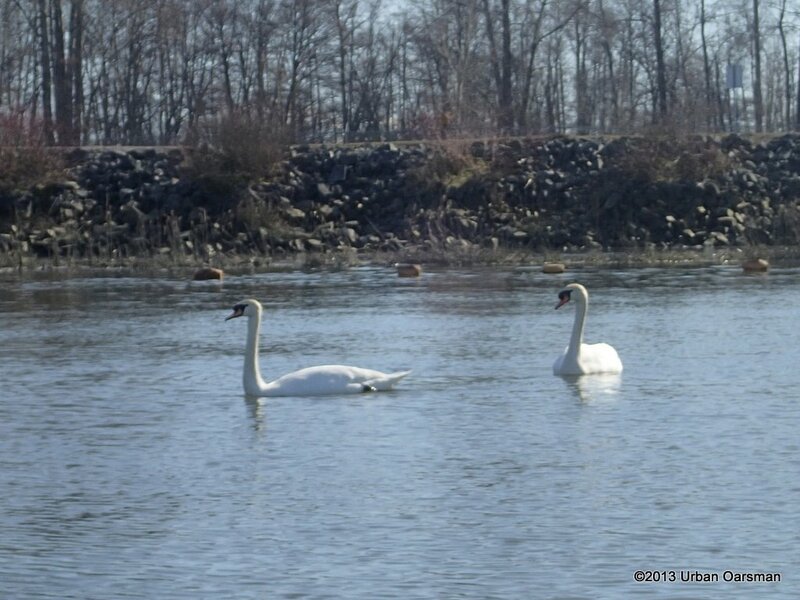 As I exit Green Slough, two Trumpeter Swans guard the east end of Captain’s Cove Marina. I head West towards Canoe Passage. There is an old beached planning hull on the beach. I continue to Lander Reach, and follow the shore line. There is another Canal/slough entrance. It is blocked by rocks and posts. The tide will rise for another twenty minutes, not very much. If I can not get into the channel now, the tide will not rise enough today to get in no matter how long I wait. I cannot enter to explore Ladner Marsh. 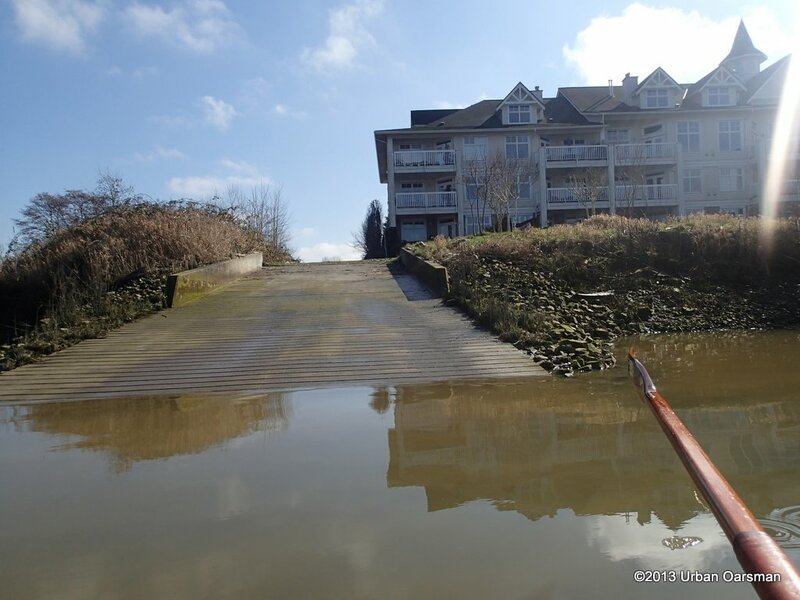 I row down Ladner Reach until I spot the observation tower. Well it is 3:20 and at this time of year it will be dark by 6:00pm. Time to head back to the Launching ramp and home. 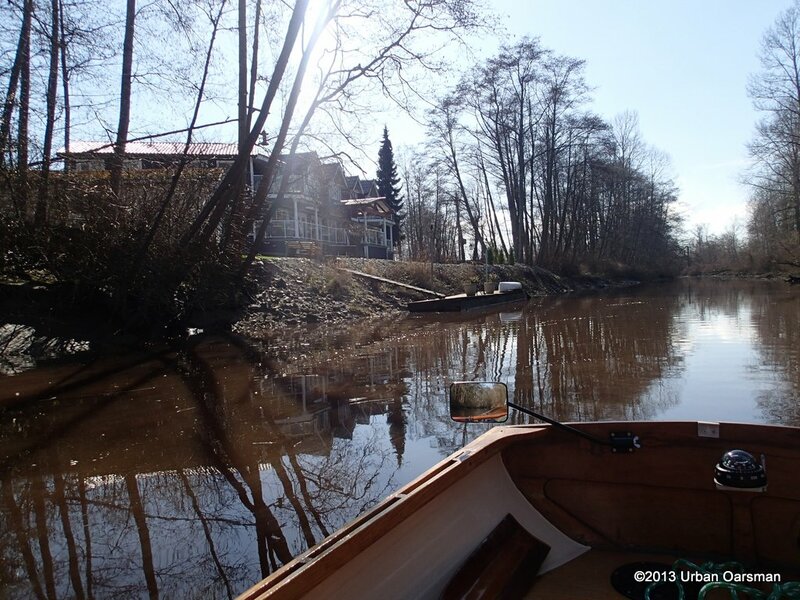 I row back up Ladner Reach towards the boat launch. I pass the stranded planning hull. There are some logs tied to the shore here. Is that derelict hull salvage too? Is this where the ghost of Bruno Gerussi haunts? Back to the dock, I put Gwragedd Annwn on to her trailer and head home, knowing that the Second Narrows will be open now. 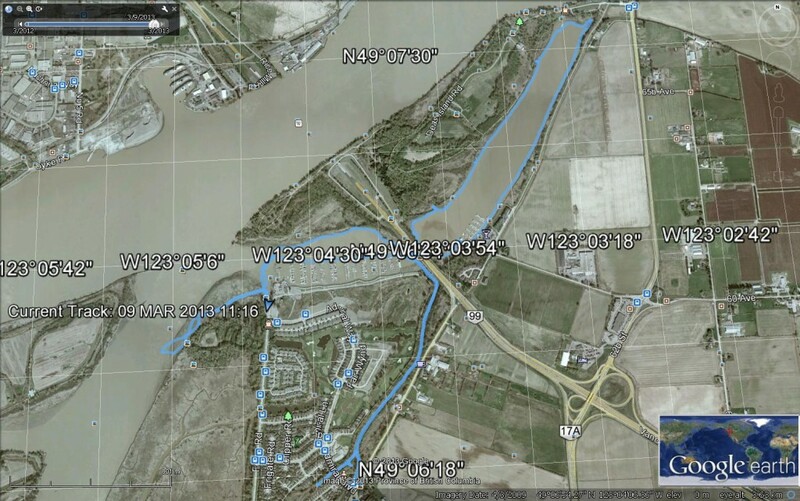 The Google Earth picture of Gwragedd Annwn’s GPS track. Click on picture to enlarge.